When your daily driver is a notebook, and you spend any amount of time behind a desk, you probably curse the time wasted connecting and disconnecting your display, mouse, keyboard, USB storage, and other peripherals. Fabless semiconductor manufacturer Wilocity already enables OEMs such as Dell to build wireless docking stations that can provide USB, Ethernet, and display connectivity (at resolutions up to 4K). Now the company is working on a new chipset that will enable multiple users to connect their laptops to a single wireless dock. Based on the WiGig standard, Wilocity's chipset uses the 60GHz frequency band to stream data at high speed over relatively short distances. Wilocity will announce next week that it has shipped one million of these chipsets, mostly to Dell. Dell offers Wilocity's current chipset in its D5000 wireless dock, and on the client side as an optional upgrade to its Latitude 6430u, 7240, 7440, 5540, and 5440 laptops, as well as its Precision M4800 and M6800 mobile workstations. I reviewed the D5000 paired with the Latitude 6430u several months ago and was generally pleased with its performance. Wilocity's next chipset, codenamed Stingray, is being developed in cooperation with Cisco. When it ships in the second half of 2014, OEMs will be able to build wireless docks that double as network nodes. These devices will primarily be of interest to the enterprise with an IT department responsible for managing access to the corporate network. When an employee or a guest connects to one of these wireless docking stations, the server to which the dock is connected will recognize the user and automatically manage their network access. A network administrator will also be able to turn off the client computer's USB ports, so they can't transfer files; limit the number of displays the user can utilize; and more. They'll also be able to push software updates to the dock, which will automatically download the update to the appropriate clients the next time they connect. 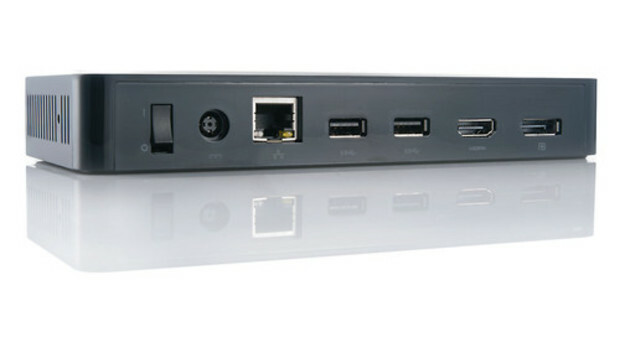 Each dock can be managed independently. By 2015, Wilocity expects to have a chipset that will enable OEMs to build WiGig docks capable of hosting multiple devices simultaneously. These docks will operate much like a wireless access point, but they'll provide Ethernet, display, mouse, keyboard, and USB connections. The photo at the top of this story shows a prototype dock hosting a laptop, a tablet, and a smartphone, with the user interfaces from all three devices appearing on the same display. The company expects the physical dock will eventually disappear altogether, subsumed into other desktop devices such as an IP phone.